Note: Enabling Purity Run will require non-disruptive controller reboots. Please note that Purity Run can currently run one app. Simple deploy a VM with Ubuntu 16.04 and install the missing requirements. 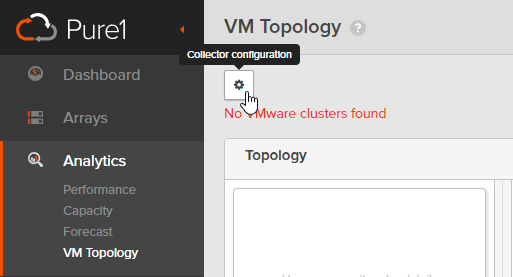 Now login to Pure1Cloud and go to Analytics > VM Topology and click on the gear icon. Click on Create Collector, type in a name for it and click on Create Collector again. Now you can copy the Installation script one-liner and insert it to your Off-Array Collector VM. env COLLECTOR_AUTH_KEY=xxxxxxxx-xxxx-xxxx-xxxx-xxxxxxxxxxxx bash -c "$(wget -O - https://static.pure1.purestorage.com/vm-analytics-collector/install.sh)"
The Installation script downloads the Docker images and configures the connection between the collector and the Pure1Cloud. After the Installation is completed connect the Off-Array Collector with your vCenter Server. You may see WARNING messages like No applicable counters found. I thought this was an error, but only the poweredoff VMs had no counters, so it is ok. A warning is a little bit to much for a poweredoff machine, but Pure seems to see it a little bit different :) . Now it could take several hours to see results in the cloud. In my setup it takes 2 hours. 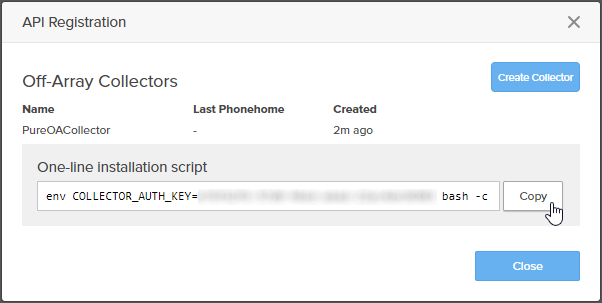 You can see the phonehome status in the API Registration on the gear icon. 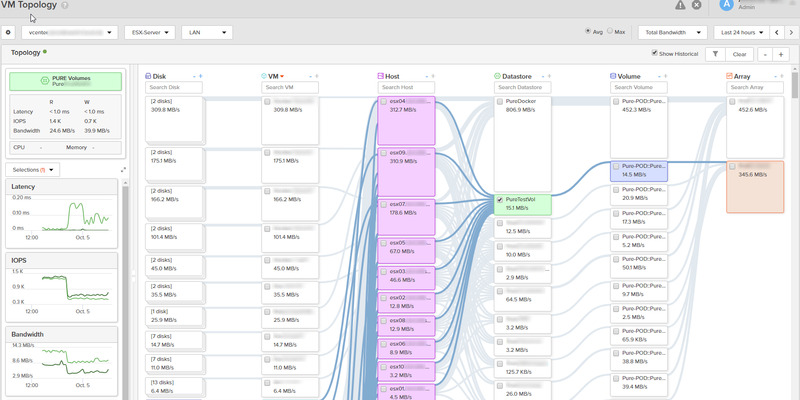 After the data is analyzed you will get an complete overview of your virtualized environment from the storage perspective. There is one messy thing in the view. If you have created a POD to synchronize data between two array, your ESXi could read or write data to both array in the same volume. The view could not get this together. As you can see the Docker-Datastore consumes over 800 MB/s but the POD-Volume only consumes about 450 MB/s which is close to the array load. The second array isn’t “connected” in this view. I think and hope that this will come in an update.